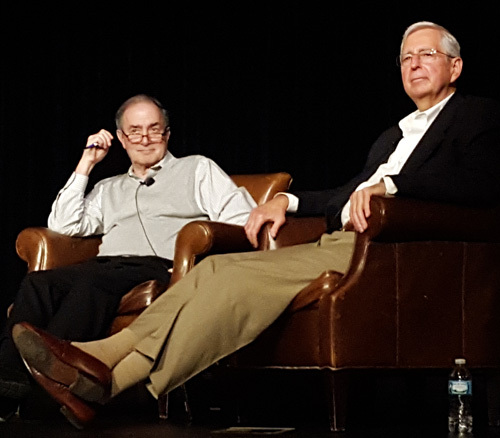 Bob Rehak, far right, was interviewed by the Trib's Rick Kogan, as a slide show of some of his mid-1970s Uptown photographs ran on the screen. "It was like a different planet. I'd never seen anything like it." That's how former street photographer Robert Rehak described the Uptown he encountered in the mid-1970s. 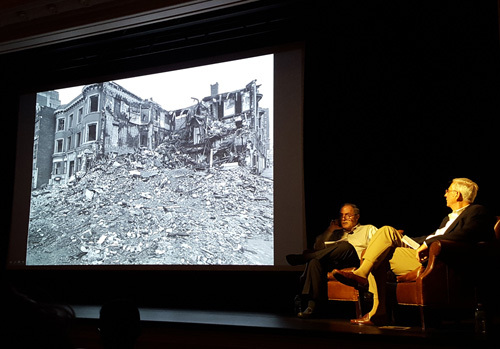 At an event at the Chicago History Museum Monday night, emceed by the Tribune's Rick Kogan, Mr. Rehak spoke of how he challenged himself to do something that frightened him. In 1973, that was getting off the L at the Wilson station and asking people on the street if he could take their pictures, and then get them to sign photo releases. 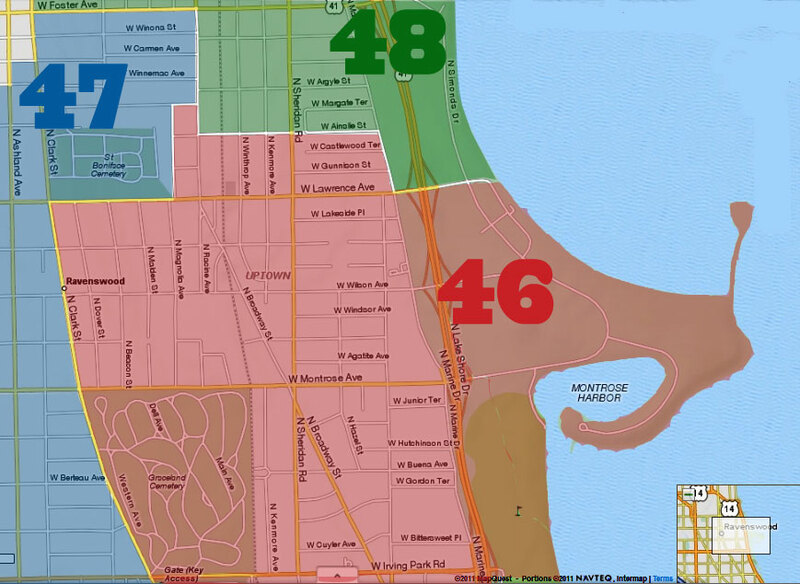 The Uptown community was very different from Rogers Park, where he lived, and the Loop, where he worked. He was teaching himself photography, and his role model, famed street photographer Weegee, said, "Be Present." Mr. Rehak realized that his fear of Uptown was holding him back and that he needed to get past it if he were to succeed at his new craft. His plan: Get off the train at Wilson and go up to the first person he saw on the street. So he did. That person was pacing and ranting in front of the Best Steak House at the corner of Wilson and Broadway. When approached, he stopped his harangue, broke out into a big smile, adopted a prayer posture, and yelled, "I am Jehovah!" Mr. Rehak thought, "I'm in Uptown!" The photo eventually became the cover of the book of Uptown photographs Mr. Rehak published in 2013. That first encounter was the first of many. Bob ended up spending much of his free time in Uptown over the next four years, eventually taking more than 5,000 photos and getting to know many of his subjects. He describes those years as a "love affair" with the community, during which he discovered that his fears were all in his head, not on the streets of Uptown. He cultivated relationships with people, and they started referring to him as "the guy with the eye." Mr. Rehak said that he discovered that instead of meeting him with hostility, most Uptowners wanted recognition, they wanted to be heard, to matter. He realized he could create a portrait of a neighborhood simply through taking photos and listening to the people who lived there. Of the people and experiences he had during that time in Uptown, he said, "It brought me out of my shell. It taught me how to talk to people, how to read situations," all of which were great job training for his eventual career as the owner of his own advertising agency. He said Uptown taught him not to be judgmental; to take people for what they were; and that if you treat people with respect, you'll get it back. When asked who he sought out people to photograph, he said looked for people who fell outside the norm, who looked like they might have an interesting story. He enjoyed photographing the children most of all, because they were "always exuberant." By the time they reached their teens, though, he said he could see them feeling pressures: gangs, money-making schemes, drugs, the hard process of growing up in a poor part of town. Why did he stop coming to Uptown to take pictures? He said that after four years, he realized he was starting to repeat himself. And then there was the incident with the Latin Kings. In 2013, Mr. Rehak put a few photos online, of the thousands he had taken in Uptown, as part of a business project. To his surprise, they were discovered by Compass Rose, the publishers of the Uptown Chicago History blog. Other publications, like Uptown Update and DNAinfo, picked up on them. Soon, to his great shock, his website was getting 20,000 hits a day. He started receiving emails from people who remembered him from the 1970s (many of whom still had the photo prints he had given them as thanks for posing for him). He said he heard from hundreds of people over the next few months, and that helped him understand and update what had happened to them over the past 35-40 years. When a publisher approached him, he was delighted to make a lifelong dream of publishing a photography book come true. He said the updates from those who had contacted him made his book better and fuller. 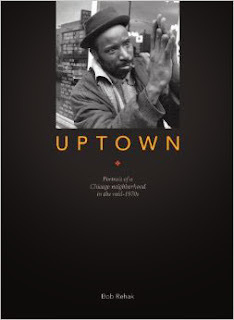 Uptown: Portrait of a Chicago Neighborhood in the Mid-1970s was released that fall. He was back in Chicago this past week to advise student photographers at Goudy Elementary School and The Latin School, who are involved in a years-long partnership, on the skills necessary for good street photography. 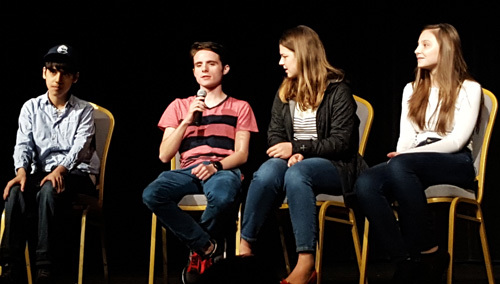 In this project, called "We Are Uptown," students went out and spoke to modern-day Uptowners to learn their stories. 35 of the best photos will hang in City Hall beginning June 3rd. DNAinfo ran a story about his visit to The Latin School on Monday, before the talk at the History Museum. 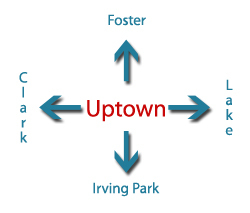 So what is it about Uptown? Mr. Rehak said that his four years in Uptown were "the most formative of my life and the closest to my heart." One student photographer said that a woman he interviewed as part of the project said that Uptown's culture hasn't changed in the years she's lived here. "Uptown's buildings may change, but the people don't." The We Are Uptown website is here, a collaboration between Goudy Elementary School and The Latin School. Come see it in City Hall beginning June 3rd. Mr. Rehak's website and photo portfolios are here. Check out his latest project, Birds In Action. You can purchase Mr. Rehak's book here, or through Amazon or Barnes & Noble.